ICWSM 2017 – Ian Stewart – Language Geek. Data Freak. 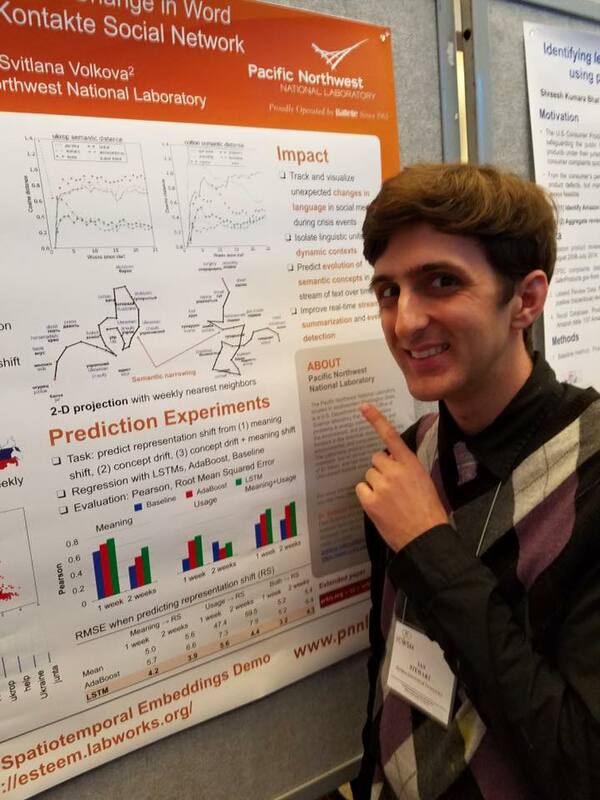 From May 14-18, I recently attended the International Conference for Web and Social Media in Montreal to present my work on semantic change that I conducted during my internship at the Pacific Northwest National Laboratory during summer 2016. Check out the full paper here and the poster here! Since it was my first large-scale conference of grad school, I tried to take in as much as possible. I particularly enjoyed the workshop on Observational Studies Through Social Media, which was a nice introduction to causal inference methods like matching. The gist of the methodology is to approximate a randomized experiment using observational data through methods that reduce the potential for confounds affecting the treatment and outcome. Propensity score matching is a nice example of causal inference as it matches “treatment” with “control” users based on similar attributes (example below). It helps researchers tackle tricky questions such as the influence of social support on suicide ideation. I tried to take as many notes as possible on the talks and panels, and I’m hosting the notes here. Check them out if you’re interested! There weren’t as many language-centric studies as I had hoped but I still enjoyed the variety of topics covered, from emoji semantics to community identity. Overall, I most enjoyed exchanging wacky research ideas with other students and faculty, particularly at informal events like the Science Slam where I tried to have fun with semantic change (slides here). The winning talk was on breakups on Twitter - messy affairs. I wish all conferences had informal academic exchanges like the Science Slam - it’s a nice reminder of how fun the field of social computing can be. I also had a tiny bit of free time to celebrate Montreal’s 375th birthday - no idea that it was older than America! The Jacques Cartier Bridge was all lit up and fireworks were everywhere. I hope to do some more exploring next time I visit Montreal!